Feast of Lanterns festivals and celebrations are centuries old and are celebrated all around the world and throughout the US - from NY to Indiana, Ohio, Michigan on to Montana and throughout California. No one knows if the Feast of Lanterns festivals were first celebrated hundreds of years ago in Japan or China or somewhere else in the ancient lands of our world, but these festivals of light continue as part of the international and national landscape. This festival is not unique to Pacific Grove. 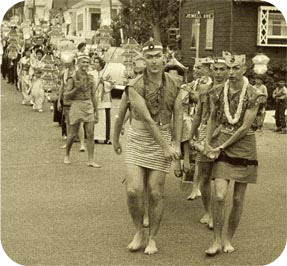 In 1905, the first Feast of Lanterns was held in Pacific Grove as the closing ceremonies to the Chautauqua Assembly. It wasn’t until December of 1957 that the Feast of Lanterns was revived as part of the city’s winter activities, and it was the next year that Mayor Shropshire asked City Councilman Clyde Dyke to chair the revival of the Feast of Lanterns. Clyde, assisted by his wife, Elmarie and the Mayor’s wife, Helen, orchestrated the Feast of Lanterns as we know it today; with its Royal Court, elegant costumes, teas, fashion shows, and the Legend of the Blue Willow enacted by the Royal Court and their families. The use and display of lighted lanterns, the boat parade that moves across the bay, a variety of family entertainment, and fireworks over the cove at the close the Festival were all introduced with the original Feast of Lanterns in 1905. 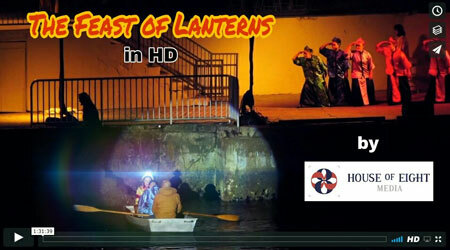 In 2008, the Heritage Society of Pacific Grove publish an extensive history of The Feast of Lanterns, "Feast of Lanterns" The Early Years, 1905-1916. 1874 - The Chautauqua Assembly was established in New York, a movement that brought culture to all who participated. The summer retreat was closed with a lantern parade and fireworks over the lake. 1875 - The newly formed Pacific Grove Retreat Association initiates a 3-week summer camp meeting under the pines. 1879 - The Retreat became the West Coast headquarters for the Chautauqua Literary and Scientific Circle. 1905 - The Methodists and Women’s Civic Club organized the celebration at the close of the Chautauqua Assembly: the first Feast of Lanterns. The closing ceremony at Lake Chautauqua centered on the Blue Willow legend and Pacific Grove patterned our ceremony the same way. 1917 - With the Great War (WWI), the Feast of Lanterns is stopped by the Federal government because it was considered “not a patriotic endeavor” 1935 - The Feast of Lanterns is revived and connected to the Miss California pageant held in Santa Cruz. 1941 - With World War II, the Feast is cancelled again. 1957 - The Feast is revived as part of the Chamber of Commerce’s Winter Festival. 1958 - PG City Councilman Clyde F. Dyke is asked to help revive the Feast. It is still tied to beauty pageants. Elmarie, his wife, assists and creates the Royal Court with jewel names. Joanie Hyler serves as the first crown bearer. Gail Maitre Tyler serves as Queen Topaz and she is the only Queen to serve twice, in 1958 and 1959. 1962 - Pam Gamble reigns as Queen Topaz and wins the Miss California Pageant. 1963 - Elmarie Hurlbert Hyler Dyke takes the reigns for the Feast with the passing of her husband, Clyde. Until her death in 1981, Elmarie hand picks the Royal Court and introduces many Feast activities including evening entertainment, the crowning of Queen Topaz, a skin diver propelled sea serpent and a taped rendition of Kate Smith’s “God Bless America” at the end of the pageant. Mary Pat Gannon Alfiler serves a Queen Topaz. 1980 – 75th Anniversary of the Feast of Lanterns is the Diamond Jubilee. For this special anniversary Elmarie selects 2 Queens. Queen Topaz Wendy Junkin Adler and Queen Diamond Sylvia Junkin Yap. 1981 – Elmarie Hurlbert Hyler Dyke passes away. Becky Desmet (Queen Topaz 1975) and her granddaughter Joanie Hyler serve as Co-Directors of the Feast of Lanterns. They put on the Feast to honor the memory of Elmarie. Beth Murray Buzza serves a Queen Topaz. 1982 – Marabee Rush Boone (Princess Turquoise 1961) becomes the Pageant Director and will serve in this role for 32 years! Pamela Woodfin Connell serves as Queen Topaz. 1987 - First year that Queen Topaz are chosen by a panel of judges during the interview process. Fireworks are reinstated thanks to sponsorship from the Lion’s Club. The Royal Court Scholarship Fund is established because of the Royal Court focus in community service and to help further their education. Joni Coleman Birch serves as the first Queen Topaz selected in the interview process. 1989 - Pacific Grove Centennial Year and Krissy Heilbron serves as Queen Topaz. Carol Bradley Lauderdale (Queen Topaz 1966) organizes the first year for the former Queens to be honored on the pier prior to the pageant. 1991 - Elmarie’s great granddaughter Trisha Muench Randall serves as Queen Topaz. Joanie Hyler serves as Queen Mom. The Royal Court returns to wearing their hair up when they are in their full regalia. History and etiquette are also emphasized by Elmarie’s family. 1994 - The Royal Court storyboards are introduced as a way for the Court to practice public speaking and interact with the public. Lena Hakim Requist is Queen Topaz 1994 and it was her idea to create the story boards. 1998 - Royal Court trading cards are introduced and this idea came from Sue Gunter. Erica Clay Chavez is Queen Topaz 1998. 2000 - Candles can no longer light lanterns on the beach. Jennifer Eddlemon serves as Queen Topaz. 2003 - John Mothershead is the first Chang to have a trading card. He decided to print the cards himself which was a bold move. Alexandra Stampher serves as Queen Topaz and the logo for that year was a drawing of her wearing blue brocade. 2005 - The Centennial celebration for the Feast of Lanterns. Sydney Stampher serves as the Centennial Queen Topaz. 2008 - 50 years of the Royal Court are celebrated with all Former Royalty invited to attend. This is the first year that all former royalty are invited to be announced on the Pier before the Pageant starts. Caitlin Greenlee served as Queen Topaz. 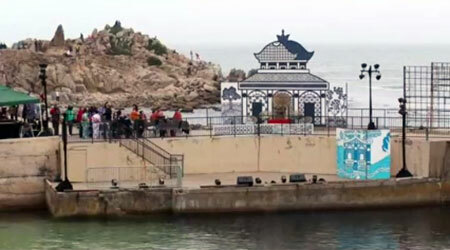 2010 - Due to the closure of Lover’s Point Beach, the Pageant is inside at the Performing Arts Center. The Pageant is directed by Dixie Layne and Virginia Coleman. Jenna Hively serves as Queen Topaz. 2011 - Fire up the Feast! The business community along with the Board of Directors for the Feast work to return the Feast to Lover’s Point. Lindsey Morgan serves as Queen Topaz. 2016 - Jason Kim is the first Scholar Chang who is officially added to the Royal Court. He is selected with the interview process and receives a scholarship. He attends all the appearances as a member of the Royal Court. Ashley Lyon serves a Queen Topaz. For the first time since Elmarie created the Royal Court that a new set of costumes has been made for the Princesses. These were made by Joni Coleman Birch (Queen Topaz 1987) and include the first Princess Peridot. Serena Paci makes history by serving as the first Princess Peridot. Joni Coleman Birch takes over as Pageant Director and changes the script. From now on, the Pageant story will evolve and change yearly. 2017 - The Feast of Lanterns Board of Directors votes to create the Royal Guard. Scholar Chang becomes the head of the Royal Guard and mirrors the role of Queen Topaz. The Royal Guard will be the knights and the Royal Court are the royalty. The Royal Guard represent the animals in the Chinese Zodiac and the elements. The Royal Court represent the 12 birthstones for each month of the year. Thor Birch, Master Rooster and Elias Yevdash, Master Horse serve on the first Royal Guard. Caroline Evans serves a Queen Topaz.